The apparent unfathomable nature of the ocean is what first attracted me to marine biology; the mystery of the unknown. The vast depths of the ocean still hold so many secrets and I find great excitement in the exploration of these alien worlds. 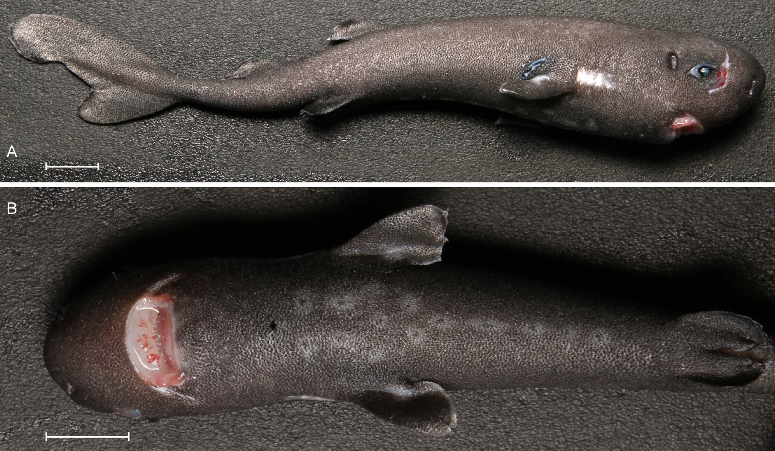 This week, a team of scientists describe the first record of the pocket shark, Mollisquama sp, from the Gulf of Mexico. It is only the second one we have ever seen! The first pocket shark specimen, a 40cm mature female, was collected from the Nazca Submarine Ridge in the southeast Pacific Ocean in 1984. It was subsequently used to describe that species and until now was the only specimen ever recorded. It would be 26 years until scientists came across the second, an immature male of just 14.2cm. In 2010, a midwater trawl survey operating in the northern Gulf of Mexico, captured this shark whilst exploring the animals associated with sperm whale aggregations. The specimen was identified as a kitefin shark and it was retained for later identification. This most recent paper is the description of that specimen. Photo of second specimen of Mollisquama sp from paper Grace et al 2015. Note pocket gland slit and photophores. Pocket sharks are not your average shark to say the least. Their overall appearance is intriguingly weird. A small ventrally located mouth, mysterious slits behind its pectoral fins and a rather rotund shape. Unsurprisingly we know very little about this shark. Here is what we do know though. The pocket shark, whilst very small and probably could fit in your pocket, does not get its name from its small size. Instead, the pocket shark has an entirely unique pocket glad situated internally just above its pectoral fins (see drawing above). External slits just behind the pectoral form an opening for to an internal pocket. There are very few cases of such structures in sharks and its possible function is even weirder still. There is only one other species of shark that posses a similar gland, the taillight shark (Euprotomicroides zantedeschia). Upon capture of this species it has been observed that a blue luminous fluid was excreted from its openings. It is believed that this fluid is used to either attract prey or to elude predators. Now the orifice in the pocket shark is very similar to that of the taillight shark and could indeed be used in a similar fashion. This luminous effect has not been observed and the authors also speculate it may house secretory pheromones used to attract mates in the dark deep-sea. Not only does this shark have a potential pocket of glowing fluid, it also appears to have glow in the dark cells on its belly, other wise known as photophores. These photophores are common in other sharks, see other post on glow in the dark sharks, and are typically used for camouflage, communication or prey attraction. From the collection of just two specimens from this genus, it looks like it is a mid-water deep-sea shark. The first specimen was collected at a depth of 330m, about 2000m above the seabed. The second specimen was caught at 580m at about 2500m above the seabed. The two areas in which these two sharks were caught were very different though. One area is a cold subantarctic Humboldt Current, where as the Gulf of Mexico is typically a warmer body of water. The differences between the two specimens of pocket shark caught seem to be too different to confirm that they are the same species. The authors can not eliminate the possibility of sexual differences within the group. For now the shark has been given the name Mollisquama sp as some of the features within the Gulf specimen are not recorded on the Pacific specimen. This is rather exciting though. This specimen of shark could actually be a new species. It will take DNA evidence and other specimens to confirm this, so keep your eyes to the deep for more updates. So do you think they are widespread (first being found in Pacific) and largely unknown because of habits? Yeah, I think they are much more common that we think. They are either deeper than our fishing efforts, or are widely ignored due to their small size. It will be interesting to see if reporting increases with increased media coverage. What a cool shark! Great post!